The castle town is located in front of the palace of the king and is the focal point in Pokémon Rumble World. Here you can meet friends, buy new clothes or balloons and accept orders of your Majesty. In the store of castle town, give your Poké Diamonds for more balloons, new clothes, backgrounds or frame. Especially at the beginning, we advise you that precious diamonds but only invest in balloons and not to spend on useless accessories. While with Poké diamonds will be covered just the beginning, they are very rare later in the game. In the beginning, you have the choice between three areas that brings you into areas with the three main types (fire, plant, water). We recommend you to be the first to choose your favorite type. As an example, consider the type "fire." At start - you guessed it - mainly Pokémon with the type "fire." Then you should go to the area, the weakness against type "fire". You are doing much more damage and defeat the final boss of the Regions (in this case the "leaves level") with ease. Here you go traveling. Before you have but to buy a balloon to reach remote areas. You'll find them in the store. Think up to two or three balloons, so you have less waiting time between trips. You can use a balloon at several times a day, but then you have to contend with a cooldown. Once you have returned from an area where your vehicle for the next start has to be made ready. This can sometimes take a few minutes. The higher your rank is Adventures (indicated in the bottom of the screen with a crown), the faster your balloons are ready for use again. In the castle of your majesty you pick you up new orders. First you need catch eleven species of Pokémon. This means that you just have to take eleven different Pokémon in your team. Such missions will have to complete often to increase your rank to continue adventure. The king tells you when that time comes. The higher your rank, the greater the Pokémon you encounter and follow that your troop. It is worthwhile to return with a higher level in the initial areas. The rare Pokémon, you get namely to see later. In addition, rare items are unlocked when you reach a higher level. Tip: The more Pokémon you collect, the higher your rank. The higher your rank, the more monsters close to you, they are also much stronger than the other. This cycle stays with you the entire game and is always applicable. In the castle town you have several options to interact with other players. First, we show you how you can meet other Miis and then we tell you why you should do this at all. The possibilities of "Street Pass" and "SpotPass" function in Pokémon Rumble World similarly as in the other StreetPass games such as "Save the Crown" or "Puzzle Swap". As you turn both functions and your Nintendo 3DS snaps shut in standby mode and carry with you, can you foreign players or friends to take when the 3DS devices meet. Thus you exchange data and your Miis appear in the other game world. Alternatively you can meet new people on the Internet. So you can also visit people from abroad and you bring bonuses. Once you choose the option "adventurers" on the bottom of the screen, you can see all the visitors and their statistics. Will you invite other players via the Internet in your world, you can spend 10 coins. In the castle town you can simply address the Miis of users. If you're lucky, they even buy you diamonds. In addition, you can present them for up to three diamonds or 500 P (in-game currency), so they bring you in new and rare areas. For each of the conditions listed below you will receive exactly 10 free diamonds. 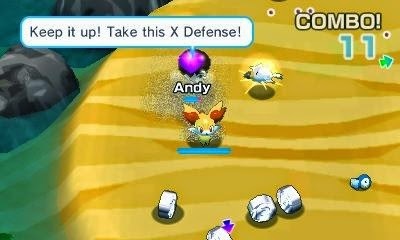 In Pokémon Rumble World you can carry a maximum of 30 Pokémon with you. In this case, one of these is also represented several times in the team. Especially at the beginning you get stronger fast companion. Your old cronies and weaker, so you are able to do no more in the somewhat more difficult areas. Now you can offer your team collapse again and certain Pokémon "dismissed" or release. This has two major advantages: You have room for new, strong Pokémon and you get 10 "P" for each redundant companion. This money you can spend on new clothes or accessories in the store, for example. You should not bring it to release over the heart of one of your pocket monsters, you can alternatively buy a Pokémon-house. So you can take another 30 companions. We summarize again briefly together, how you get free diamonds. 1. The easiest way to get to the gem, the functions StreetPass and SpotPass . While you carry your 3DS in Standby mode when you can meet on the street other Miis. Friends or strangers visiting your city, and spend a bit of luck to you with a few diamonds. Here you can see extra rewards when the encounters with other 3DS owners accumulate. 2. In addition to street and SpotPass, can you other players via the Internet to invite to your town - this only works once per day. Nevertheless, the whole thing worthwhile: you speak the Miis in the city on, you'll get with a little luck more diamonds or your cronies take you for a couple of "P" in new areas. 3. Alternatively complete missions of the king - here you get the most Poké-diamonds. Every day he has a ready task for you. Visit him for him in his castle. You will receive this clunker for the conclusion of the contract and for specified secondary objectives. The missions you can play several times. So you have made several attempts to successfully complete all side quests and to gather the maximum number of diamonds.